Maybe we should call this beauty week! My lashes are definitely not as full and long as they were two weeks ago. I don’t think they’re completely falling out. I think it’s more part of a natural cycle, but since they all grew in at the same time, they’re all falling out and replenishing at the same time. So I’m forgoing the false lashes for now, but mascara is über important. My favorite are the tubing mascaras– they really do help lengthen the lashes I have, plus they’re waterproof but easy to wash off. 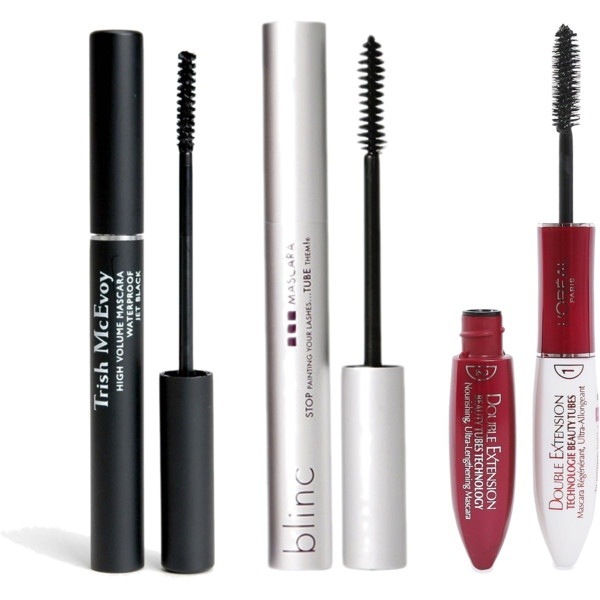 The Trish McEvoy and Blinc are the same formula, but I like the skinny Trish wand the best. I’m not sure about the formula of the L’Oreal, but it’s a good drugstore alternative. Trish and Blinc both sell a primer, too, but I like that the L’Oreal comes with the primer. In the interest of fiscal responsibility, that’s what’s in my bag now. And while I’m using so much of it (several layers builds up the super short ones!) I think the bargain is a good call.